Once an assessment has been created, a variety of functions are available to allow users to govern existing assessments via the Assessment Manager. 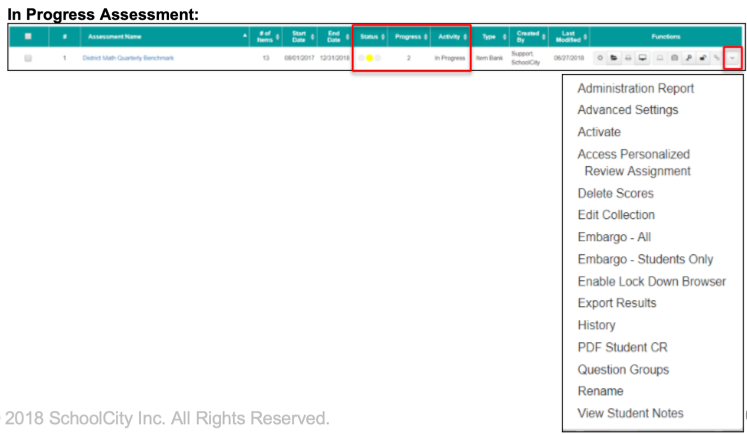 This document is an overview of the function buttons and menu items of the Assessment Manager for users with the Admin or District role in SchoolCity Suite. In the Top Menu Bar, click the grid icon (or current module name) to open the navigation grid menu and select Assessments. Note: Please see the Help document, Basic Navigation: Navigating the Launchpad 6.0, for more information. 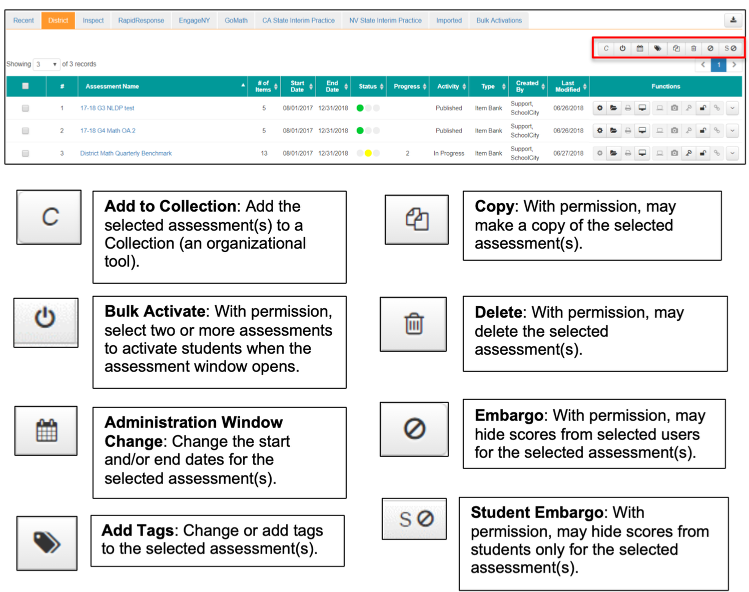 Use the bulk operator keys to make changes to one or more assessments at once. Check the boxes to the left of the assessment names to complete a function. 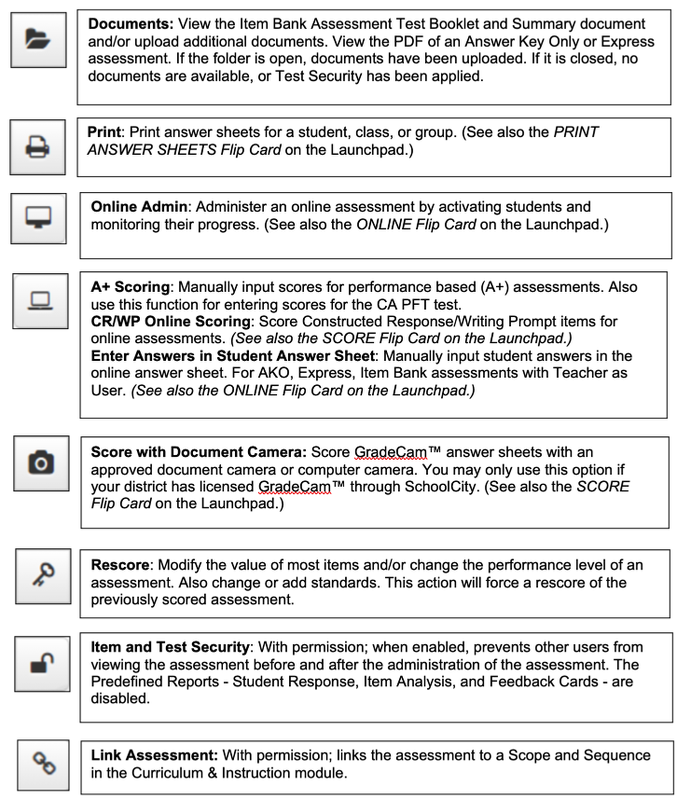 Click on the Assessment Name (in blue) to review the Assessment Summary which includes: School Year, Subject, Points possible, Answer Sheet Template (if scanning is selected in assessment setup), Method of Delivery, Administration Window, Answer Sheet Printing Start Date, and Scoring End Date. The Item Details tab displays all information about each item. View the standard details by clicking on the green circle with a plus sign. Close the details by clicking on the orange circle with a minus sign. 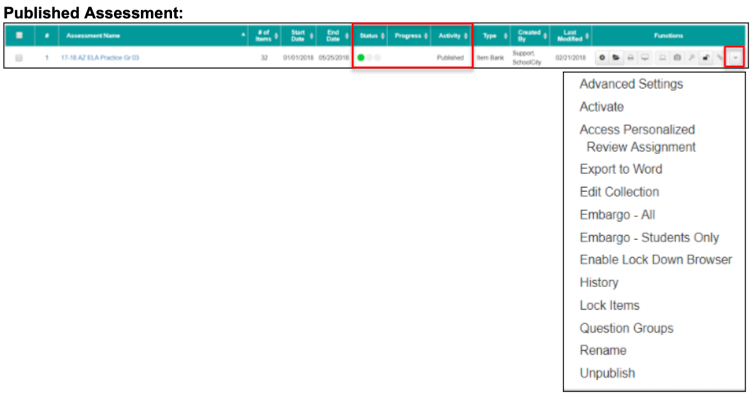 The Performance Level tab displays the performance level set selected for this assessment (if done during assessment creation). Each view may be downloaded to PDF and printed. 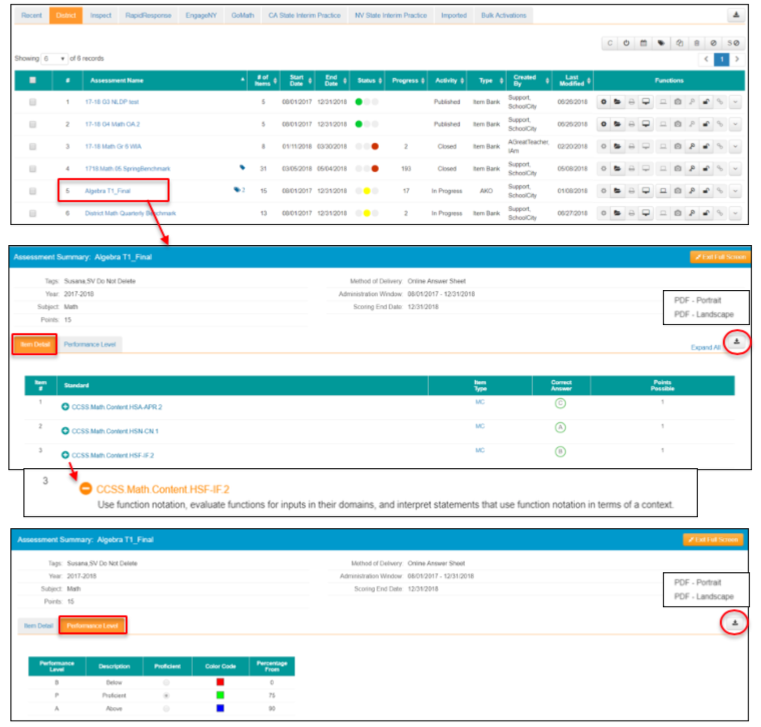 The buttons and drop down menu items located under the Functions column heading are designed for users to edit, administer, score, and add additional security to a specific assessment. Additional functions can be found under the down arrow icon to the right of the function buttons. The functions will vary depending on the status of the assessment and assessment type. Some of these functions are controlled by permissions. Activate: With permission; students can be activated for a published or an in progress assessment. Add to Collection: With permission; add this assessment to an existing collection or create a new collection. Administration Report: Displays the number of students who have/have not taken the assessment by school, grade, teacher, and period. With permission, scores can be deleted. Admin users may move scores from one assessment to another providing the number of items and item types are an exact match between the two assessments. Advanced Settings: Go to Advanced Settings to refine/revise original settings for scheduling students, online administration, and to set flags for specific students. Delete Scores: With permission, delete scores for all or selected students on the selected assessment. Disable Lock Down Browser: If available, Respondus Lock down browser can be enabled or disabled. Edit Collection: With permission; if part of a collection, refine/revise the collection. Embargo-All: With permission; hide the results of the assessment from selected users for a specified time. 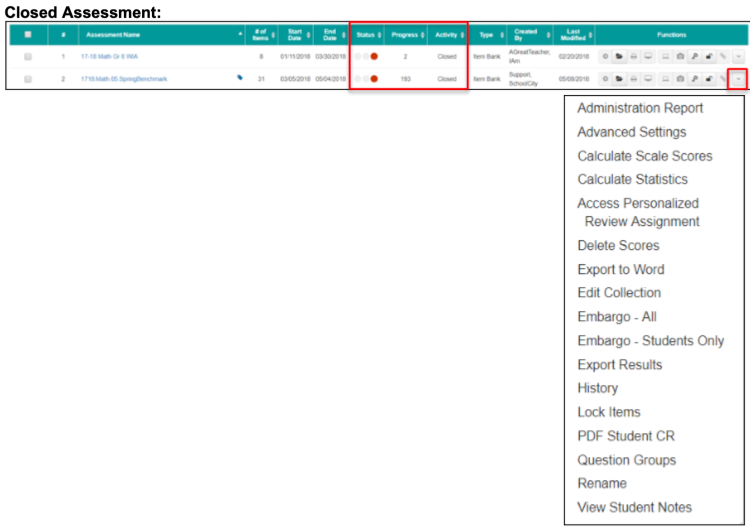 Embargo-Students Only: With permission; hide the results of the assessment from students for a specified time. Export Results: Export students’ responses, tested date, raw score, and performance level to a CSV or Excel file. Export to Word: Export the Student Test Booklet and/or Summary document to a Word document that can be revised/edited. As long as the changes do not impact the order of items and answer choices from the original, the test can be taken on paper and scanned. History: View the changes made to the assessment since its creation and who made them. Lock Items: Lock the items used on an item bank assessment to prevent other users from using the same items on future assessments. PDF Student CR: Export students’ responses on constructed response items to PDF. Publish: Publish an unpublished assessment. Question Groups: Organize assessment items into groups for reporting purposes. Rename: Modify the name of the assessment. Unpublish: Unpublish a published assessment in order to make revisions/edits to the Setup. View Student Notes: View notes students may have made, if any, on the assessment. To learn more about managing assessments in SchoolCity, see the guides in SchoolCity, Manage Assessments.